Without trying this, if you wanted to do it directly I think you need to look at creating a chart with two Y-axes because you are plotting Cases based on two different categories, but I am not certain this will work. You can hide the second Y-axis by making it transparent. The more indirect way that I would thoroughly recommend you try would be to create Goals for Cases. Goals are great even if you don’t have targets, because each Goal can measure “in-progress” and “actual” items in different ways, or even from different entities (eg in-progress sales from Opportunities by est. close date, actual sales from Orders by date fulfilled). They also pre-calculate the answers, so when you view the chart you are charting maybe 24 or 48 values, not the aggregate of many thousands of underlying case records on the fly. 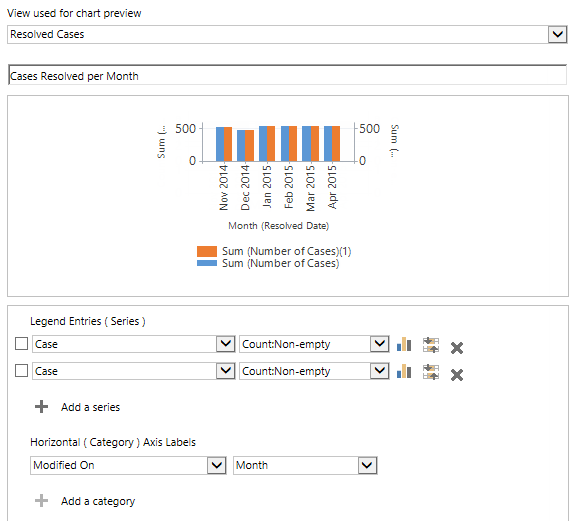 So you would create two Goal Metrics, one for open Cases by created on date, one for closed Cases by last modified date (since closed Cases cannot be edited, this is a perfect “proxy” for closed date). Then create a Goal per month using these Metrics. Do the first one by hand to test, but you can create a whole bunch of others by using data import to create them. Chart the Goals and you’re done. You might want to customise the Goal entity to add a field for “category” or something like that so you can easily create a chart of just your Service goals, or cases specifically, separated from sales goals. If I ever get time, I might write this up as a worked example, but in the mean time, I hope this gets you started. Thank you for this, but I still can’t get this to work. Any other options? I have coding for both case creation chart and case closed chart I want to combine. I can’t figure this out! Have you created Goals for your Cases? Doing open and closed cases on the same chart could be tricky, you might be able to get away with some tricks to use multiple X-Axis, but Goals is by far the easiest way to get this right. Thank you! I am going to try that today. IF you have the means, can you give me some guidance on creating these two goals? I don’t want these goals shown to agents. I just want to use these metrics for a chart only.